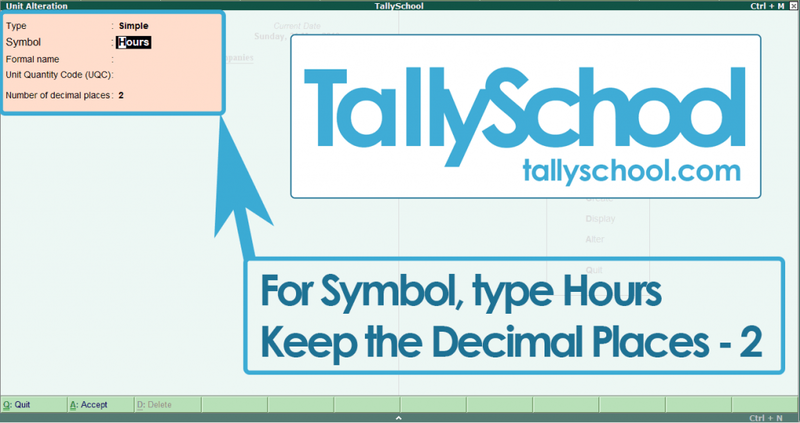 Today, I will be showing you one of the most demanded features of tally i.e. payroll in tally. I will be showing you everything which includes employee categories, attendance, pay heads, salary details, income tax details and so on. 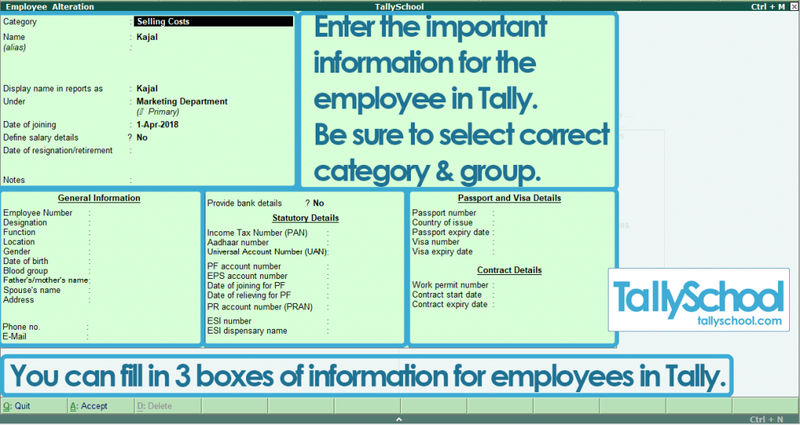 Tally is called Tally ERP 9 because it is much more than just accounting. It is a full fledged enterprise resource planning system – full form of ERP. We are going above just accounting in tally into payroll in tally. Let’s first see what is the meaning of payroll? In simple words, payroll means a roll or list of a company’s employees and the amount they are paid which we generally call salary or wages. In Tally, we can maintain payroll details of employees in a way that you cannot even imagine. It is really very good. Right from each and every detail of an employee to their income tax and TDS details, we can maintain everything in payroll in tally. We just have to define the details once and then we are all set. We can easily pass the payroll entries in tally. If you want to use payroll in tally, you have to first enable the option because by default it is not enabled. From Gateway of Tally, go to Accounting Features. Now, under Cost/Profit Centres management, there is an option called maintain payroll. Type Yes, against the option and press CTRL + A – a tally shortcut for saving anything in tally. Congratulations! You have successfully enabled payroll in tally. Now, we are going to look at employee categories, employee groups and employees in tally. If you know ledger categories, ledger groups and ledgers in tally, then employee categories, employee groups and employees are in that similar order. Employee categories are mainly used as cost centres in tally. For example – selling costs will include employees from marketing department. Or, production costs will include employees from production department. Employee groups are used for grouping employees of different departments in a company. For example – marketing department, production department, finance department and so on. Employees are the 3rd and last level of categorization here. It is the actual employee who is working in the company under various departments. For example – an employee named Kajal is working as after sales support. She will be under selling costs category and will be under the group – marketing department. Let me show you how you can create all of the above in tally. First we will create employee category, then employee group and then finally the employee. We will take the above example of Kajal here. She is an after sales representative working in the company. Employee category will be selling costs and employee group will be marketing department. We will also create another employee who is working in the production department named Ajay and his employee category will be production costs. So, from Gateway of Tally, go to Payroll Info. Select Create under Single Category. Now, you will see an employee category screen in tally. First option is Name. Type in there – Selling Costs. Leave the options as it is. Press Enter and save it. Congratulations! You have created an employee category in tally. Now, we will move forward. Similarly, I have also created another category named Production Costs. You should create it right now. Here is how you have to create employee group in tally. In the Payroll Info. menu, go to Employee Groups which is just under Employee Categories. Select Create under Single Group. 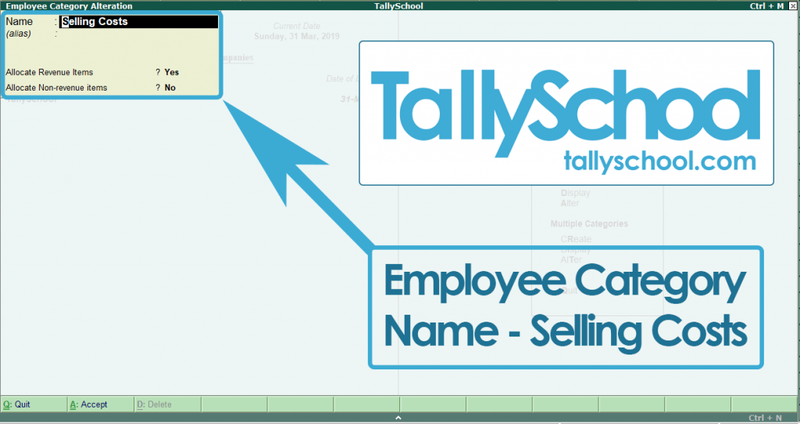 Now, you will see employee group creation screen in tally. You will notice the selection is already on the Name as in the picture below. Press backspace and you will be on the option of cost category. Now, select the employee category of selling costs which we have created. In the Name field, type in Marketing Department. Leave the other options as it is and press Enter a few times to save it. Congratulations! You have successfully created an employee group in tally. Now, we can go ahead and create an employee in tally. In the similarly, I have created another group called Production Department which will have the employee category of Production Costs. You can create this employee group in the similar way following the method above. It is very easy to create an employee in tally. Here is how. Go to Employees from the Payroll Info. menu. Under the Single Employee, select Create. Now, you will see the selection is once again on the name of the employee. Press backspace and select the employee category as selling costs. In the option of Name – type Create. In the Under option – select Marketing Department. Select Date of Joining as 1st April, 2018. Leave the option of defining salary details to NO for now. We will discuss it later. After this, there are 3 boxes of options which are very easy to fill in. They are just about the details of the employee. Fill it as per the information you have. For this example, I am leaving it blank. Press Enter a few times and save the details. Congratulations! You have successfully created an employee named Kajal in tally. In the similar way, I have created another employee named Ajay in production for which the category will be Production Costs and the group will be Production Department. Now, let us go forward and see other important details about payroll in tally. This time, I will show you how you can create units for work, attendance/production type and pay heads in tally. Let’s start with units for work. Units for work in tally are mainly used for workers or employees who are paid on the basis of hours per day. 1 Day of 10 Hours – it is a compound unit. I am creating days and hours just so we can create a compound unit. Otherwise, generally for employees who are paid monthly or on the basis of days, the functionality is already available. Let’s create a unit called Days. In the Symbol option, write Days. Leave the Formal Name blank and Unit Quantity Code as Not Applicable. Keep the Number of Decimal Places to 2. Press Enter and save it. Congratulations! You have successfully created a unit called days for payroll in tally. In the similar way, you can create unit for hours. I am not going to do it here because the method is exactly the same as above. You can have a look in the image below for better understanding. Now, we will create a compound unit by using days and hours. Let’s do it. You will be already in the Unit Creation screen as in the picture below. Now, press backspace on your keyboard so the selection will go on the type option. Select the Type of Units to Compound. Now, select the first unit to Days. Under the Conversion, type 10 because generally the work hours are 10 per day. In the option – Second Unit, select Hours. Press Enter and save the unit. Congratulations! You have successfully created a compound unit in tally. 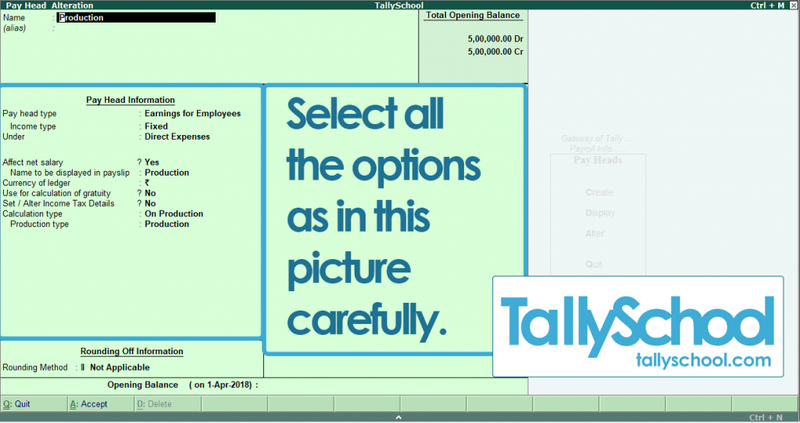 Now, we will see how you can create attendance and production type for payroll in tally. Everyday, employees’ attendance needs to be registered. Now a days, cards are used therefore, you exactly know at what time the employee came to office and left the office. To account that in tally, we need to create an attendance type. We will not be making attendance daily in tally. It can be either a monthly or a yearly voucher in tally. In the Payroll Info menu, select the option Attendance/Production Types. Give the name Attendance – Leave with Pay which means even if the employee did not come to office, his salary will not be cut off for that day. It will be under Primary. For the option of Attendance Type – select Leave with Pay. Now, in the similar way, we will create Production Type in tally which is normally used for recording the attendance of workers or employees who work on hourly basis. You will be in the same Attendance/Production Type creation screen. In the name type – Production. List of Attendance Type will be Production. Now, you will see the option for Units. Select Days of 10 Hours – this is the compound unit that we have created. Congratulations! You have successfully created both the attendance and production types for payroll in tally. Now, we will move on to pay heads for payroll in tally. 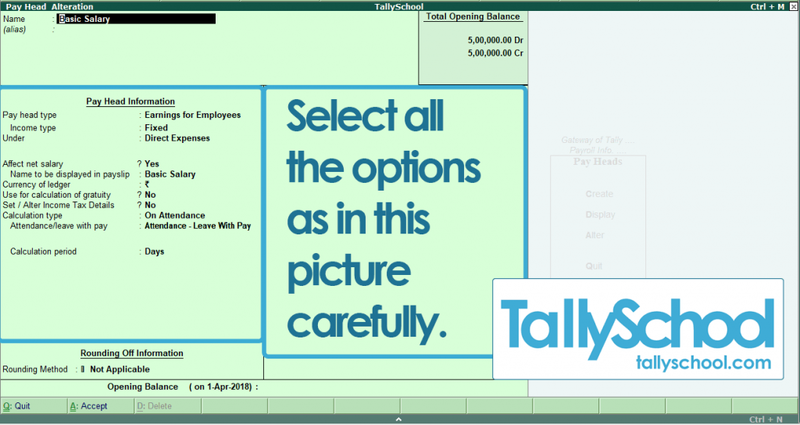 Pay heads in tally is used to define the payment details and other information which will be used by tally to identify how the final salary will be calculated. Let’s create a pay head in tally. Here are the steps. In the Payroll Info, select Pay Heads. In the Name option – type Basic Salary. For pay head type – it will be Earnings for Employees because we are defining the pay head for salary here. In the Income Type – select Fixed. It will be under Direct Expenses. We will keep Use for calculation of gratuity & Set/Alter Income Tax Details to NO. In Calculation Type – select On Attendance. Under Attendance/leave with pay option – select Attendance – Leave With Pay. Select the Calculation Period as Days. In Rounding Method – select Not Applicable. Press Enter and save the payhead. Congratulations! You have successfully created a pay head in tally. In the similar way, we will create another pay head for production. Here are the steps. We will name is Production. Leave all the other options as it is and directly come Calculation Type option. Select On Production. In the Production Type – select Production – we had created this as Days of 10 Hours. Select the Rounding Method as Not Applicable. Congratulations! You have successfully created all the pay heads in tally. 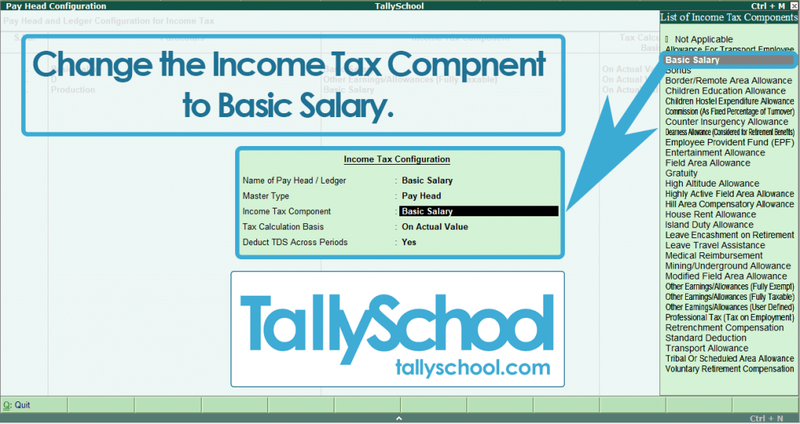 Now, we will look at how you can define salary details and income tax details in tally. 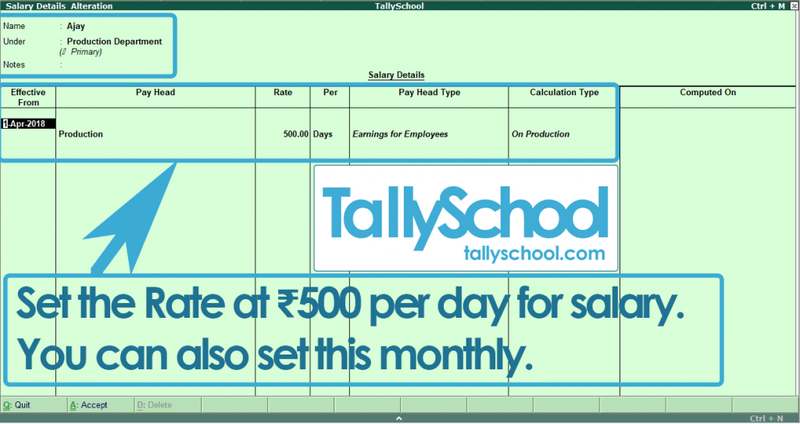 Salary details in tally are used so that total salary is calculated on the basis of that. We will enter the actual salary of the employees here. 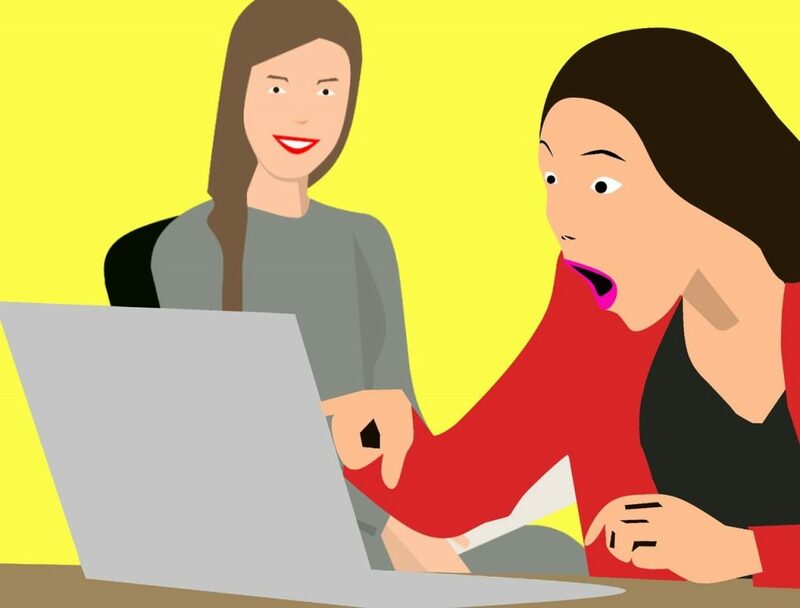 Let’s define salary details for Kajal – who is the employee which we have created at the beginning before in this post. Here are the steps to define salary details for Kajal in tally. Select Salary Details from the Payroll Info menu. From the groups or employees, select Kajal. In the option of Effective from – type 01-04-2018 or the date from which the employee joined your company. For pay head column – select Basic Salary. In the Rate column – type 1,000 which means Kajal will be getting a salary of ₹1,000 per day. Now, select the option – End of the List and press Enter to save the salary details of Kajal. Congratulations! You have successfully defined salary details for Kajal in payroll in tally. Now, we will define the salary details for Ajay who is in the production department. Here are the steps. Select the date effective from – 01-04-2018. Pay head will be Production. Rate will be ₹500 per day. Save the salary details of Ajay by pressing Enter. Congratulations! You have successfully defined salary details for Ajay. Now, we will define Income Tax details of both our employees – Kajal and Ajay. The main purpose of defining income tax details for employees in payroll in tally is to set the income tax details which are applicable on various components of the salary of that employee. Also, it is used to define various allowances, perquisites and other deductions which are applicable to the employee. In simple words, as an employer, we have to define all the income tax details of an employee and this is what we are doing in tally right now. If you are an employee in a company, you might be getting a Form – 16 at the end of the year from your employer. In that Form – 16, all the details relating to income tax are there. In tally, here is that place where all those details come from. Let’s define income tax details for both of our employees i.e. Kajal and Ajay. Here are the steps. In the Payroll Info menu, select Income Tax Details. Now, select the Pay Head Configuration. You will see both the pay heads which we have created – Basic Salary and Production. By default, the income tax component will be Other Earnings/Allowances (Fully Taxable) and Tax Calculation Basis will be on Projected Value. We will change both of them. Select the pay head – Basic Salary. Now, a list of Income Tax Components will open up. Select Basic Salary from that. Select – On Actual Value in the option of Tax Calculation Basis. For the option – Deduct TDS Across Periods – select Yes. Do the same for Production pay head. Congratulations! You have successfully configured the pay heads for income tax in tally. Declarations – in which you have to declare allowances and deductions for the employees in tally. Override Exemption Value – this is used to manually override the exemption value which automatically got applied if you have configured it in a payhead. Override Tax Value – here you can override the tax value manually that is applicable to an employee. Tax Configuration – this option is used to configure allowances, deductions, other incomes of an employee. Then, in the 1st point here – which is declarations – you have to declare them. Previous Employer Details – In this option, we can set income/exemption details and tax deducted/paid details but of the previous employer. The above options are very basic and easy to fill in. It is just putting the data which can be available from the employer or the employee. Therefore, I have not shown it here how you can do it. Now, we are in the final stage of payroll in tally. It is indeed the payroll entry for salary in tally. We have created or defined the following details for payroll in tally. It is like a pyramid from which we went from upwards to downwards. Those steps were necessary for you to create the final entries of salary for employees in tally. Let’s create payroll vouchers in tally for that. First we will create an attendance voucher for both of our employees and after that, we will create payroll vouchers. Let’s first start with Kajal. Here are the steps. From Gateway of Tally, select Payroll Vouchers. Now, select Attendance by pressing CTRL + F5 which is the shortcut for attendance voucher in tally. Now, press ALT + A which is the option of Attendance Autofill. As we have already defined all the salary details of Kajal, we can use the option of Attendance Autofill and tally will do the rest of the work for us. You will see a small window for entering the details of attendance autofill. Firstly, enter the voucher date. Select Selling Costs as employee category. In Employee/Group – select Kajal. In the option Default Value to Fill – type 300. This will take 300 days as worked by Kajal in our company. The last option is Sort by – select Employee Name and press Enter. Press Enter once again and save the attendance voucher in tally. Congratulations! You have successfully created an attendance voucher in tally. In very similar we will create another attendance voucher in tally which will be for Ajay who is in production department. Process for creating an attendance voucher for Ajay is almost the same as Kajal. Just select Production Costs as Employee Category. Attendance/Production Type will be Production. Default Value to fill will be 320 for our example. And last option – Sort by – will be employee name. Congratulations! 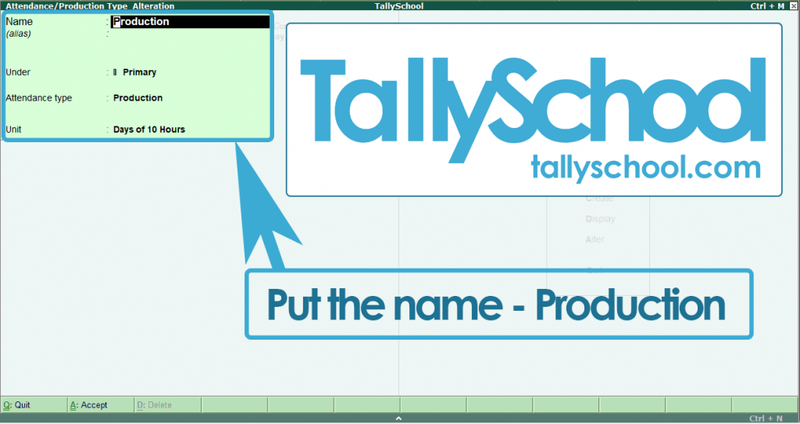 You have successfully created another attendance voucher for production in tally. Now, we are going to look at last and the final voucher in this whole process of payroll in tally. It is Payroll Voucher in tally. We have created attendance vouchers with the number of days attended by employees. We have also defined the salary that the employees will be getting, when we were defining the salary details in tally. So, now on the basis of that and all the other details that we have defined, we can pass a simple Payroll Autofill voucher similar to Attendance Autofill in tally . You will be in the Attendance Voucher right now. So click on Payroll from the right hand side bar or press CTRL + F4. Now press ALT + A and a Payroll Autofill window will open up. In the first option – Process for – select Salary. From 01-04-2018 to 31-03-2019. We have set 01-04-2018 as the joining date for both the employees. Select Employee Category as Selling Costs and Employee/Group as Kajal since first we will be passing the payroll entry for her. Sort by will be Employee Name. Payroll/Bank/Cash ledger will be Bank since for this example, we are paying to the employees directly from the bank account. We can set it to different payroll ledger as well if you like that. The salary should be automatically calculated as ₹3,00,000. The calculation is 300 days of attendance multiplied by ₹1,000 per day. In the similar way, we will pass the payroll voucher for Ajay. You just have to select all the details of Ajay while you are Payroll Autofill. The total salary of Ajay will be ₹1,60,000 which is 320 x ₹500 = ₹1,60,000. Congratulations! You have successfully created payroll vouchers for both Kajal and Ajay in tally. PDF will be uploaded soon. This is indeed a long post. If you have read it completely till here completely, I bow down to your hunger for knowledge. We have seen almost every bit of payroll in tally. 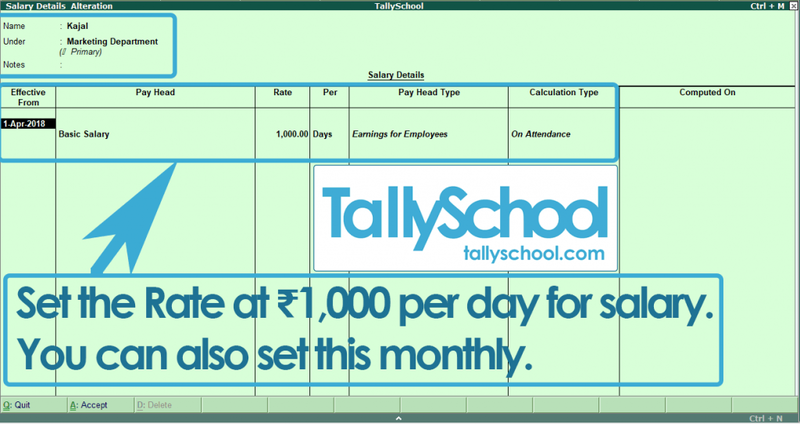 After learning this, you should be able pass a payroll entry or salary entry in tally just like any other voucher entry in tally. This post is long because I am explaining each and everything step by step. Otherwise, passing a payroll entry in tally won’t take much of your time. The entire process of setting up of payroll in tally is like a pyramid. We go from top to bottom. And, finally we pass the payroll entry. I am sure you have understood this well in tally. If you still have any doubt, question or suggestion, you know what to do. Just comment down below and I will be happy to help you. I am sorry Mohammad Ibrahim but I do not have any vacancy for jobs.